We’ve been working really hard to make Mediatoolkit an even better experience for you. We are proud to say that we have now released a major upgrade. We now collect all brand mentions from VKontakte! This means that, in addition to already existing results from websites, Instagram, Facebook pages, Twitter, forums, blogs, and comments, you can also receive real-time notifications and analyse the popularity of your brand or company on the largest European social media network. With more than 410 million profiles, VK is an incredibly rich source of data for any marketer that is intent on doing business in Europe. VK is available in several languages and especially popular among Russian-speaking users. Suffices to say, if you’re not tracking mentions from VKontakte, you might be missing out on a lot of valuable customer feedback about your brand. Tracking VKontakte is available on all free and paid accounts by default. If you already have queries set up in your Mediatoolkit account, you don’t have to do a thing to receive VK mentions. If you don’t have a Mediatoolkit account, register here. To add a new query, simply input your query in the top right corner. 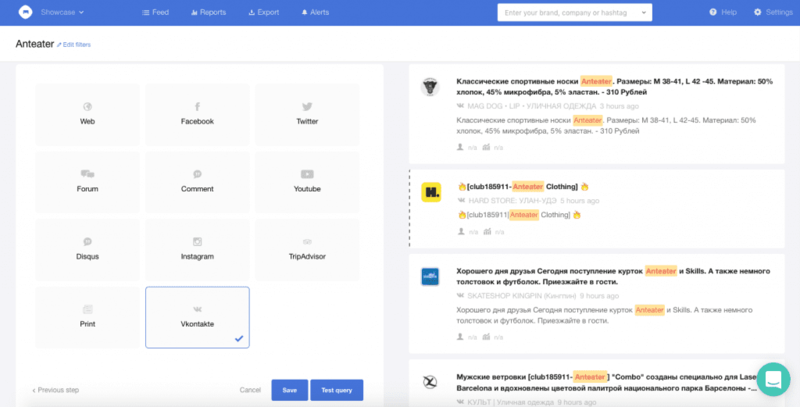 The tool will automatically start tracking and you’ll receive reent mentions from all types of sources: VKontakte, websites and other social media channels like Facebook and Twitter. 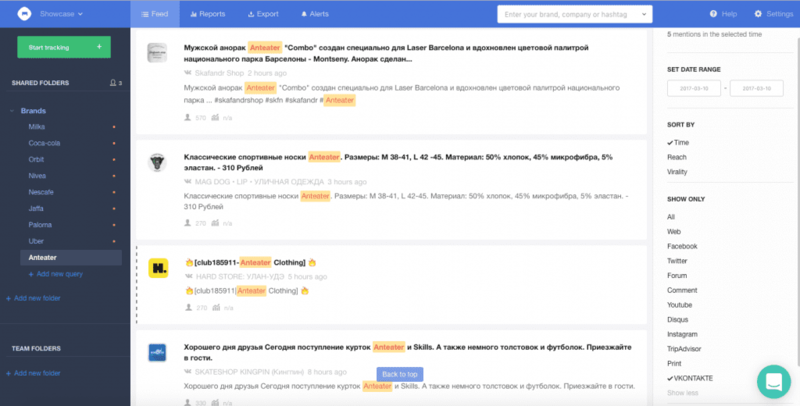 Mediatoolkit can track mentions in all languages, and written both in Cyrillic and Latin script – both are often found on VKontakte. If you want to get notified only about VKontakte mentions, you can customise your search by going to Edit filters -> Sources. You can even test your results by clicking on test query to see what you will get! After you’ve set up your query, dig deeper into data and you get a lot of insight about how your brand is performing on social media. For example, you will see many of your mentions are coming from VKontakte in comparison to other sources, or which mentions about your brand had the biggest reach. For example, for the query Хорватия (Croatia) we found that more than half of all mentions come from VKontakte. 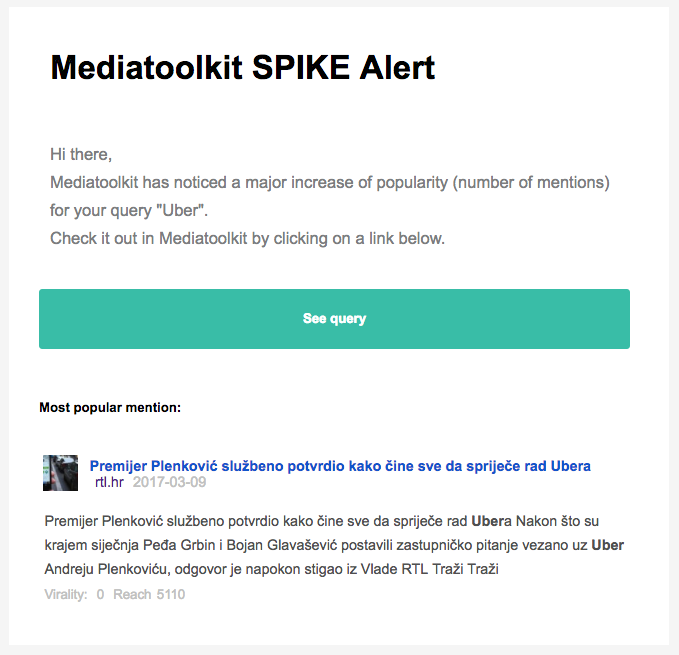 Register to Mediatoolkit and start tracking VK mentions now!